COME CELEBRATE YO BiRTHDAY ! 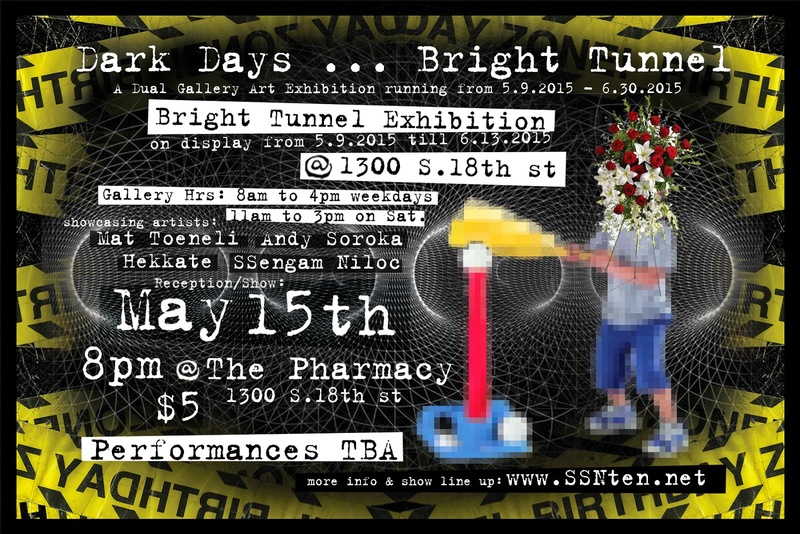 this is the official OPENiNG RECEPTiON for #DARKdaysBRiGHTtunnel DUAL GALLERY ART EXHiBiTiON ! this night will celebrate the hard work of 7 Tyler School of Art Graduates under the celebratory umbrella of the new Album Release DARK DAYS . . . BRiGHT TUNNEL ... with a full blown VARiETY SHOW that will certainly leave all of your needs satisfied ... what a #HAPPYDAiLYBiRTHDAY experience ! only $5 !!! for all these wonderful performers . . .
Titano Oddfellow - the man the myth the legend ... a blast from the past and a strongman for the future! Combining amazing feats of strength not seen since the golden era of the sideshow and circus ... be ready to B.B.E. amazed !
. . . ∞ . . .
Running from May 9th till June 30th . . .
Running from May 9th till June 13th . . .